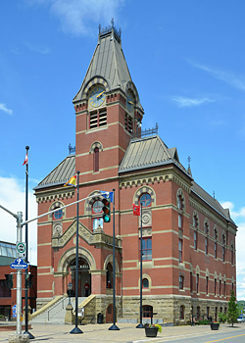 In front of City Hall in Fredericton, the provincial parliament building, and on the hill of the central Administrative Building of the University of New Brunswick, the yellow and red flag of the province can be found waving in the wind. Those who look closely will see a golden lion mid-stride above an ancient galley on a yellow background in the red upper third of the flag. What is the significance of these symbols, which can also be found on the provincial coat of arms? In heraldry, the Scottish “Lymphad” (a type of galley) is a traditional representation of shipbuilding and navigation. These were New Brunswick’s two most important industries when Queen Victoria conferred upon the province the coat of arms with the ship and lion (on May 26th 1868). However, the lion refers to the connection to the Braunschweig (‘Brunswick’ in English) region in current-day Niedersachsen (Lower Saxony), which the province was named after when it was officially founded in 1784. This was done in honor of the British monarch George III, who was not only the king of Great Britain and Ireland, but also the duke and elector of Braunschweig-Lüneburg (also called Kurhanover or Hanover) in the German nation of the then-Holy Roman Empire. George III came from the House of Hanover. The fact that he ruled over both Great Britain and Braunschweig is thanks to the connection between the House of Hanover and Great Britain, as well as the British parliament's ruling on the line of succession at the beginning of the 18th century. Queen Anne Stuart of Great Britain died without an heir, and the ‘Act of Settlement’ of 1701 conferred the British crown upon the closest Protestant relatives. From 1714, the Protestant line of succession in the English monarchy was sustained by British regents provided by the House of Hanover. George I was the first Hanoverian to sit on the British throne in 1714. The flag of New Brunswick | © Goethe-Institut Montreal The personal union between Great Britain and the Hanoverians was dissolved in 1837, when the order of succession changed. In contrast to his predecessors, George III was born in Britain, spoke English, and proclaimed himself to be British in his inaugural speech. He later married Sophie Charlotte from Mecklenburg-Strelitz, a refined German princess, and the namesake of the provincial capital of Prince Edward Island, among other things. Although their marriage was politically motivated, they were still happy together and had 15 children. The history of Fredericton is undeniably influenced by the British and British loyalists. The Loyalists who fought under King George III in the American War of Independence established themselves on St. Anne's Point in 1783. Their arrival entailed the foundation of the province of New Brunswick and its separation from Nova Scotia as a sign of its special colonial status. St. Anne's Point was renamed Frederick's Town in honor of George III's second son, Prince Frederick August, the Duke of York. This was shortened to Fredericton after the city was officially designated the provincial capital on April 25th 1785. The street names in Fredericton’s old town (Queen, King, Brunswick, George, and Charlotte Street) show this colonial history and the relationship between the kingdoms of Great Britain and Hanover (Braunschweig-Lüneburg) in the 18th and early 19th centuries. People can visualize this connection with the royal House of Hanover and with the German princess of Mecklenburg by walking past the historical houses from the time of the loyalists on George Street or by visiting the Charlotte Street Art Centre, found on the street it's named after, which runs parallel to George Street. The lion is the most popular animal for coats of arms, as it symbolizes courage and is the king of beasts. For instance, it can be found on the coat of arms of the English king Richard the Lionhearted (from the 12th century) and of the House of Welf. This animal has a particularly special meaning for Braunschweig. In around 1166, Henry the Lion from the House of Welf, the most powerful German territorial electorate of the Middle Ages, had a bronze statue of a lion erected in the city of Braunschweig as a symbol of his power. This statue stands on the Burgplatz Square in front of Dankwanderobe Castle, and is one of the city’s most recognizable landmarks. 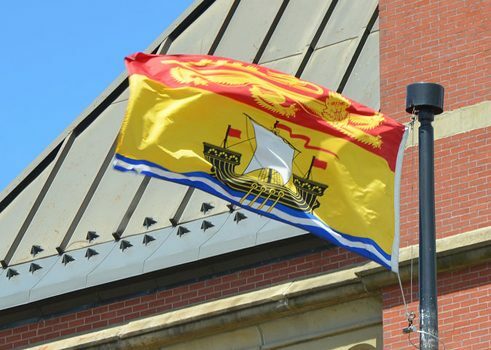 The lion on New Brunswick’s flag therefore is reminiscent of the province’s connection both to England and to Braunschweig and Henry the Lion.